The first U.S. military drones to be used in complex, joint tactical operations in an active combat theater were a small squadron of Predators, part of the Air Force Air Combat Command’s 11th Reconnaissance, which were deployed over Bosnia during the war in the former Yugoslavia, in the summer of 1995. The next year, Congress drastically increased the budget for the procurement of Predators, from $50 million to $115.8 million. 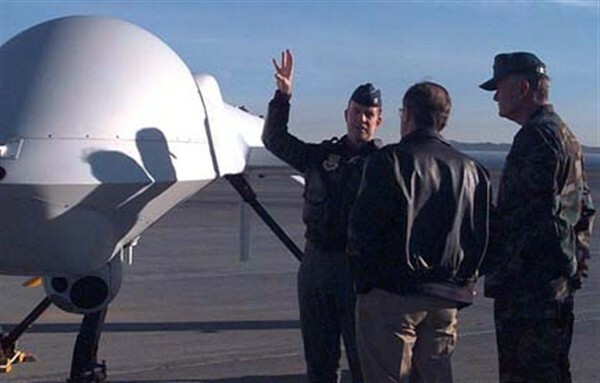 “The operational capabilities embodied in the Predator UAV system,” announced General Richard E. Hawley, the commander of Air Combat Command (ACC), in August of 1996, “are a significant first step toward the continuous, real-time Reconnaissance, Surveillance and Target Acquisition required by 21st century joint warfighters. ACC is committed to developing our ability to employ the family of UAVs in that role.” In its first year of use, among other successful missions, Predators helped the U.S. confirm that the Serbian military had reneged on its promise to withdraw guns from positions outside of the besieged city of Sarajevo. By the end of 1996, U.S. UAVs had completed over 1,575 missions in support of the joint U.N/NATO mission in the former Yugoslavia. “I’ve seen the cities of men and understand their thoughts. The text of the report begins, “As indicated by Homer’s insightful statement” which, incidentally, is a loose translation of a line from the opening passage of the Odyssey, and which appears nowhere in any official published editions of Homer, “THE CONCEPT OF INFORMATION DOMINANCE has a long history. What is so vastly different today is that technological capability, system performance and operational infrastructure support have converged to allow us to exploit new opportunities in ways never before imagined.” (Capitalization in original). The authors of the report are excited about the UAV’s potential to be the most advanced and effective tool for information dominance and to “meet warfighting needs well into the next century.” The report presents a vision of war in which it is the technologies that enhance information acquisition are valued more than those that increase killing power. Bosnia, as the authors would have it, represented a landmark step in the direction of that vision. UAVs in their modern form were first acquired by the U.S. military in 1985. That year, the U.S. purchased an unmanned aircraft called the Pioneer, which was developed by a company called Israeli Aircraft Industries. The Pioneer first saw use in a combat theater during Operation Desert Storm, in 1990, and remained in operation until 2007. The Predator’s deployment in Bosnia was significant because it was the first time that UAVs had played a substantive role in complex combat missions involving several units. The Predators, which flew out of a base in Hungary, conducted reconnaissance and surveillance in support of ground forces and weaponized, piloted aircraft. Among other things, the Bosnia experience proved how useful it was to be able to maintain an aerial presence without endangering the lives of pilots. In August 1995, Serbian troops managed to shoot down a Predator; shortly after that, another Predator lost power and was destroyed by its pilots (to prevent secret technology from falling into the hands of the enemy). As Thomas J. Cassidy Jr., president of General Atomics Aeronautical, which made the Predator, told Bloomberg Businessweek in 1996, if the drone is shot down by the enemy, “the pilot just turns the key off and goes to lunch, 260 miles away.” But the real benefit of the Predator was its data-gathering capabilities. At the time of its first deployment, the Predator was already capable of remaining airborne for 24 hours or more, collecting constant surveillance footage which was transmitted live, via satellite, to joint tactical controllers and central commands. As a result, the Predator offered a vision of a new kind of post-Cold War warfare strategy which removed boots from the ground, but remained rich in information. The Predator seemed almost too good to be true; thanks to its success in Bosnia, the U.S. accelerated the development of other UAV systems, such as the Global Hawk and the Dark Star. Indeed, the war served as a testing ground for UAV technical features which remain in use today, such as live video feed and the ability to fly at great altitude for long stretches of time. More broadly speaking, the Bosnia experiment inaugurated two trends that feature prominently in the use of drones today: the integration of drones into joint tactical operations and the use of unmanned aircraft as a tool of low-risk humanitarian intervention. In short, when we look at the current drone operations in Pakistan, Yemen, Afghanistan, and east Africa, we are looking at a model of warfare which was first tested in Bosnia—a war that many people would consider completely different to the kinds of conflicts we are engaged in now. While it is a little known fact that Bosnia was a seminal moment in the history of drones, the American intervention in that country is often cited as an example and pretext for similar humanitarian military actions. The ideas of drone warfare and humanitarian intervention are therefore closely related, and their histories developed in parallel. When read in the context of drones and aerial surveillance, the line of Homer quoted in the 1996 UAV report suggests that “understanding men’s thoughts” is key to gaining tactical advantage in war. And yet, that does not appear to be Homer’s vision of war. In fact, the published translations of this line refer instead to Odysseus’ varied experiences in foreign lands—and the lessons he learned about the human mind—rather than anything relating to warfare. When Odysseus slays the suitors at his palace in Ithaka, he is likened to a lion among deer. War is the point of contact between opposing bodies of physical force (Dolon, the most famous spy in Homer’s epics, and the one who most most closely approximates a drone-like vision of warfare, meets a horrifying end at the hands of Odysseus and Diomedes). Homer’s ideal of war is much more about ordinance than surveillance. The fact that the 1996 report modified and re-appropriated the line of from the Odyssey to suit the purposes of the drone program is telling. Despite the intentions of the authors of the report, the line of Homer highlights that, and contrary to what many figures within the U.S. military have argued, the drone was not merely a new, effective tool for fighting the same kinds of wars. Instead, the deployment of drones in Bosnia heralded a new kind of warfare altogether.